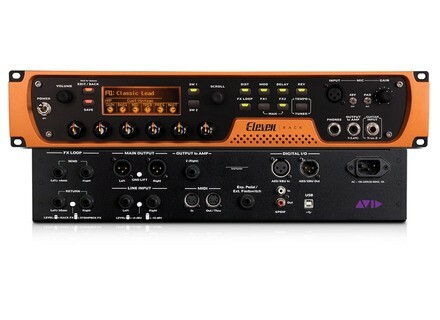 Eleven Rack, Guitar Amp Simulation Rack from Avid in the Eleven series. crankyrayhanky's review"A Recording Guitarists Dream!" I had no compatibility issues with my Rain computer. Setup had a few snags, so support sent me a zip file that allowed me to install the most up to date software. Once completed, there have been no major issues.The interface is fantastic and very guitar amp familiar with easy to adjust knobs. I went through racks in the 80s and now hate scrolling parameters- i want to plug in and play. This interface allows that without too much painful parameter scrolling. The software works, but 1 strange thing is the start up- it seems to be unresponsive until I click it twice, then a window tells me only 1 version can be run at a time. I click it off, but it's a notable quirk that could be annoying. I bought this in May of 2011. At the time PT8 was brand new; since then, it's gone through a few updates which is annoying, as it costs money to get the newest features. That's too many charged updates in just over a calendar year and shows a complete lack of respect for customers. Also, it costs money to get support, which reeks of arrogance. These business ideals are less than attractive for many people, thus the Avid bashing you will see on many forums. However, i have grown to love Pro Tools, so I have been caught in their web. I'll likely pay for an update in the near future. This unit can serve so many purpooses- di guitar tones, reamping, ada conversion..I can get up to 5 inputs in 1 take- xlr, 2 analog & 2 digital ins (external preamps needed). The xlr preamp sounds decent, though it does not provide a ton of gain, just enough for a ribbon or 57 on a guitar cab at 80dbs. The di tones are ok, not spectacular, but can get the job done. I prefer to track a di and reamp later with real amp/mic, but you can get passable tones out of the amp sims. The matchless is probably my favorite, it sounds super cool and chimey. The tape delay is awesome, I will use that often Even if one upgrades, the unit can sound great in the loop of an amp. I did need to send it in for repair for a hones jack that went south...now my guitar input is acting inconsistant (?!) I upgraded to a Kemper, but still feel like I received my money's worth, as it gave me a year of headphone tracking in which I wrote a few tunes and had a great time. I still use the interface and PT, and will use the fx for live amp playing. The verstaility is unparalleled...but the company tactics are not cool. jkessel's review"Amazing tone and feel in one hell of a box!!" It was pretty easy to setup. Came with some good presets but like all modelers most weren't. Little tweaking changed that and made this thing little thing so much better. It's very plug n play, other units like the Axe FX and Line6 stuff has so many tweak options that you end up spending more time tweaking than you do playing. This thing is more like a bunch of nice amps, cabs, mics, and effects. Pick the setup you want, and start playing. No deep editing to get lost in, messing with tube sag, tube bias, and all that stuff that gets confusing. The manual is very informative, never left me asking questions. When they first came out there was a few bugs that most had to be sent back to Avid (on their dime) but after the fix it's worked perfectly with zero problems. Mine came with Pro Tools LE 8.4, new ones come with Pro Tools 9 (full version) with a free upgrade to 10. I've never been a big pro tools fan but it was nice to have the options. The USB jack is a little finicky on the 11 Rack, any little bump and my computer wouldn't recognize it anymore. Had to reboot my computer to fix it. No big deal, just little annoying. My favorite thing was the feel, really got close to that real tube feel. Had that sponginess that other modelers and solid state amps just don't get. Some of the models sound dead on to the amp and there's comparisons out there to prove it. Others while very close still weren't quite there, but still very usable. For the price it's an amazing unit, definitely beats over 3x for an axe fx. I've used dozens of different modelers dating as far back as the original digitech RP1 in 1992, nothing can touch the 11 Rack. While it doesn't have all the options of some of the bigger ones IMO the tone and feel on this are much better than any of the competition. James...'s review"Falls just short of being great"
Now let me first state, I have tried literally every piece of guitar equipment out there. Handwired amps, production amps, hybrid amps, modelers, whatever. I've used it all in a lot of different environments. I've noticed over the last few years that modelling technology has been getting scarily close. It started with the digitech gsp1101 a few years ago and then really burst out of the scene with the Axe-fx that some of you may be familiar with. 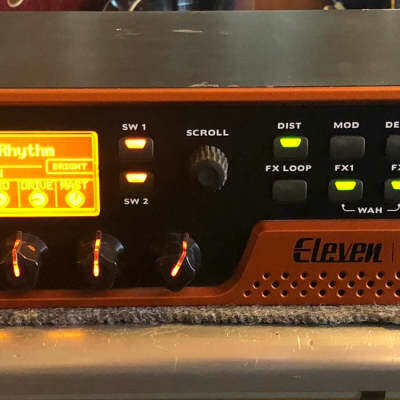 For a while the axe-fx has been hands down the best modeler I've tried, and when the 11 rack came out I knew I had to give it a shot, given the fairly attractive price. Features are pretty good. The unit was wisely designed to work as a kind of interface for recording, and in this regard it's got an upper hand over most modellers that leave any compatibility with PC's and DAWs as an afterthought. The 11 rack comes ready to work with pro tools with a full recording feature set which is very nice. Not many other processors can claim this really. The amp selection is decent. Same for effects. I think the philosophy here is supposed to be quality over quantity, which I think most guitarists are learning to appreciate. I'd rather have 15 great amp sims than 80 bad ones. In my use it is probably the most compatible unit I've had. The focus here is recording, although you can use it in a live situation. Whether Digi wants to admit it or not, this unit is in direct competition with the Axe-fx as well as some of it's lower end peers. It's not trying to be any of them, but obviously comparisons are going to happen. 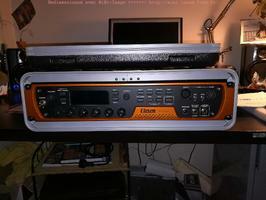 I think the axe-fx is more of a live/recording unit while the 11 rack really focuses on recording and excels there. Here's what it comes down to. The 11 rack is a well thought out unit and from a functional standpoint it really whips most of the competition. Everything was thought out well and it packs in some serious features for the price. But the sound quality is, at the end of the day what really matter. The effects are pretty darn good. I would say it's what line 6 wishes it could be. The emulations are pretty mucb ace. Sometimes effects can sound a bit...much? But hey that's guitar for you. Now the amps on the other hand are not quite there to me. Yes they are a step up from most modellers in this price range. Are they as good as the real ones? No. They just aren't all the way there. And not as close as the rival axe-fx. I don't want to detract from the unit though as I am a lot more picky than most people since I have some of the real world amps to compare. The 11 rack sounds good, it's just a bit less real to me. The amps are more studio-ized if I can even use that word. Long story short, if you are recording it's worth the price. For live use I would look elsewhere. This isn't that kind of unit. Using it as a hardware interface with a Mac Book Pro, and as a re-amp device. Started with in with Pro Tools 8, upgraded to Pro Tool 9 and the expansion pack. One of the biggest reasons of why I wanted it is to use as a re-amper, more below. Avid does does updates, unfortunately many times they are paid upgrades that other companies will throw you free. The one headache is that if I hot plug the unit, I have to restart my lap top since it will not see the interface once it's unplugged. Installing drivers and software...good to go. Or alternatively just plug in hook up a set of monitors or head phones and rock. 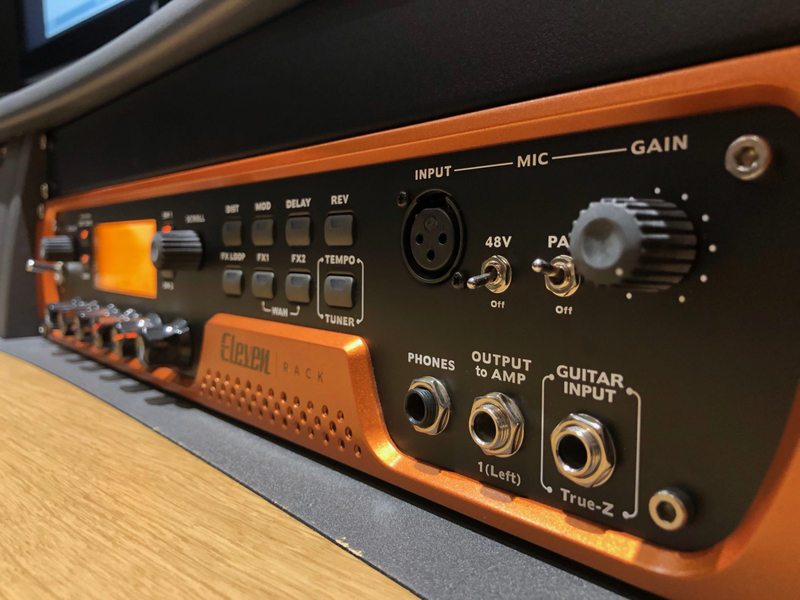 All functions are fairly easy to get to from the front panel, editing patches and sounds via the ACTUAL knobs will be preferential for many users. That said I much prefer the interface that is only available via Pro Tools. 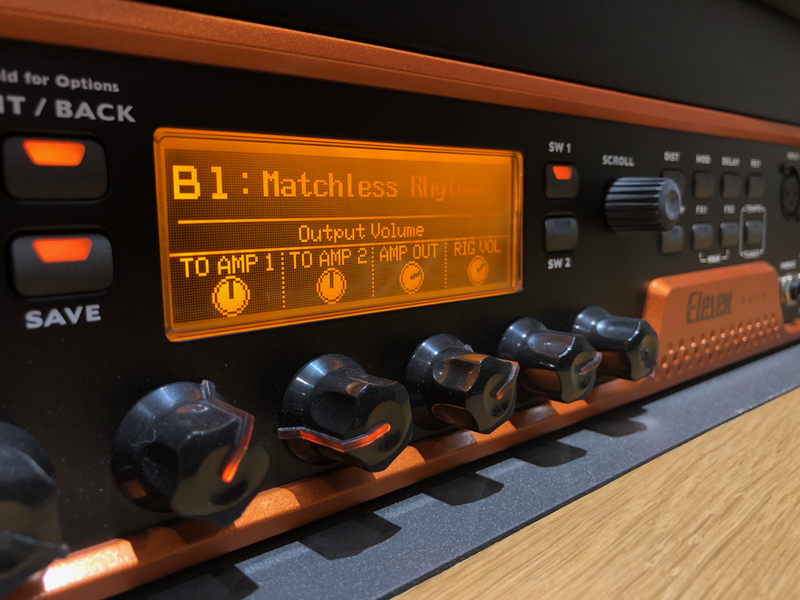 The re-amping features and use as a audio interface will be all fully usable in any other recording program, the only missing link is the Graphic User Interface. Open your software select input 1 for a DI guitar signal, if you wanna hear/print the actual sound you have dialed in select input 3 on another track. If you don't want to hear the direct monitor output that circumvents the software and busses straight to the output/monitor the select re-amp as input in Eleven Rack instead of guitar. The software will still print the DI signal regardless. Record a track, when you're happy with it and want to mess with different tones set that tracks output to 3/4 re-amp out, select re-amp as input in guitar rig and then select input 3 for your track to record the processed signal. 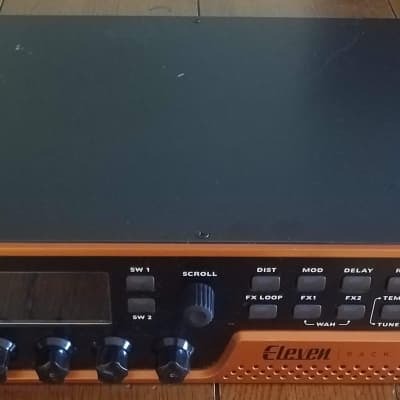 Now that is all fine and good to re-amp the Eleven Rack, but where it gets interesting is actually using your fave amp for it. and then either use a loaded down signal and return to the Eleven R efx return, or mic it and use the mic input (input 2 on your software to record it) and print that. Most elegant re-amp solution I've come across. Lots has been said about 11R. The new expansion pack adds some nice new models, liek a Bogner XTC with 2x12 cab that is voiced rather nice. The model of the Exotic RC boost is a good one, especially when used with the model of the Matchless DC 30. Finally a parametric eq and stereo delay added. Downsides...you still can't run 2 drives at once. The other you can't use 3rd party speaker/cabinet impulses. Avid has announced the release of Pro Tools + Eleven Rack, a new specially designed bundle for guitarists combining the recording software and the Eleven Rack Expansion Pack add-on.